The below mentioned amounts of chilli and chilli powder makes the dish medium hot. Do adjust as per individual preferences. 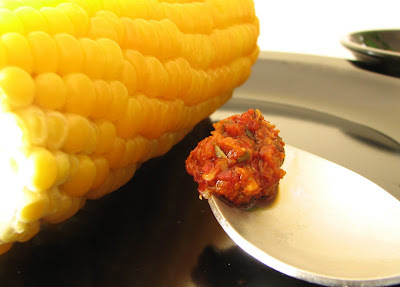 For the peri-peri sauce, finely grind together the Kanthari chilli and the garlic paste. Switch off flame then and quickly transfer it to a pan at room temperature in between the sneezes. 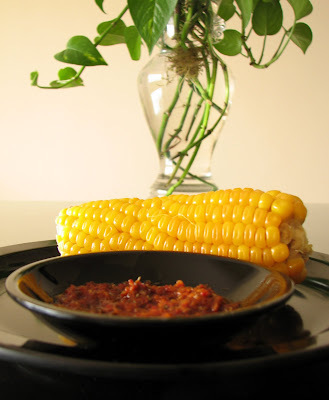 Mix the garlic paste with the roasted chilli powder and flakes, lime juice, olive oil, oregano and salt to taste. 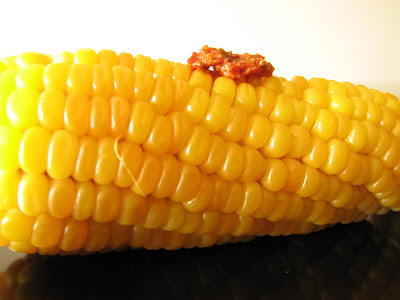 Slather the peri-peri sauce on a cooked ear of corn and munch on! This is a tangy, fiery and satisfying dish. It also takes very little cooking time. Definitely a life-saver for people with voracious appetites needing quick gratification. peri-peri sauce looks spicy !!! I love spicy sauces !!! Nice :) I shall try it sometime. Yeah... While making this, I was thinking that this dish is perfect for Vidya - its vegetarian, its spicy, its tangy. Gorgeous and very creative photos Sarah. I can't wait for corn on the cob!! !